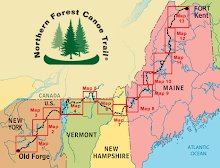 Largest and Longest elevation drop on the trail is down the Saranac River. About 1,300 feet over 41.5 miles. There are several dams along the way. The river can be low at points with a need to get out of the boat and pull it through. Fortunately for me, there is some rain along the way and the hydro stations release enough water that it is not necessary to get out of the boat. Sometimes however it gets shallow and taking weight off the seat and transferring it to the seatback and foot pegs is what allows the boat to get through shallow spots. At the end of the Saranac River, it passes through the city of Plattsburgh, NY. The city was the site of a famous naval Battle of Plattsburgh between US (3,400 men) and British (10,000 men) warships during the War of 1812. http://en.wikipedia.org/wiki/Battle_of_plattsburgh The US won. The river through Plattsburgh is continuous Class I & II rapids. Fun. Coming around one bend, there is a coffer dam and large signs advising that a portage is required. Time to haul the gear up a long steep flight of stairs (with ropes, again) and start walking. Soon, the obvious portage route vanishes. A police station is there, and they advise me to "put in anywhere". There is no work being done on the river, and no clear reason for the forced portage. In goes the boat, right behind the police station, just below where it was taken out!